Watch Dogs was a game that, back in 2012, was the talk of the town after E3. It was the first glimpse we were ever given of the potential of the next generation home consoles. So much promise, so much excitement, and yet, in the end, the game didn’t live up to expectations. And I while I don’t necessarily disagree, my opinions on the game are somewhat different. It’s been two years since the game released and I’ve owned it since day one. But it’s only now that I’ve finally completed the main story and gathered my thoughts together. Watch Dogs takes place in present day Chicago where a city-wide network, known as the ctOS(Central Operating System) has been installed and controls various aspects of everyday life. Street lights, pipe systems, cameras, cell phones, explosives, cars, you name it, it’s controlled by the ctOS in some fashion. Some view this as a big brother scenario and aim to either take down the ctOS or control it to make it into what it should have been. And caught up in this world without privacy is a man named Aiden Pearce, a vigilante who wants nothing more than to take down the people responsible for the death of his niece. The story had a lot of promise. Here we had a character with a real motivation for doing the things that he does. He was human. Aiden is a man tortured by his past. His niece died because someone placed a hit on him for something that he did. and he blames himself for it and seeks to atone by bringing the men responsible to justice. But unlike Batman, Aiden isn’t afraid to stain his hands red. And the story isn’t detached from what drives him: His family. You meet his sister and her son and you get to, somewhat, know them. And the moments between Aiden and his nephew Jack are some of the best. Their quiet, subtle, and the you can see some semblance of emotion on Aiden’s face as he processes what his life and his world have become and the effect that that has on Jack. In the end, Aiden’s story comes full circle and there is some semblance of emotional payoff. I was not entirely invested in his character, but from what I can gather most people didn’t even get inside of his head and thus they didn’t really get the story. I at least managed to get into his mindset and that helped me to sympathize with him and those around him. I feel for the man, I really do, but at the end I have to ask: Was everything worth the sacrifice? And Aiden is not the only character in the game of course. You have Jordi Chin, a very eccentric and comedic man that works great alongside Aiden’s more straight and serious demeanor. Every scene he shows up in is great and I wish there was more of him in the game. You have Clara Lile, a character that I could never quite wrap my finger around. She’s a member of Dedsec, this worlds analogue of Anonymous, and she gives Aiden greater access to the ctOS and becomes his partner sort of. It’s honestly really hard to tell if there’s a romantic link between the two because there are scenes that imply there could possibly be, but at the same time it isn’t very clear. And lastly you have Raymond Kenny, the man who programmed the ctOS and the first to actively rebel against the company that hired him, Blume. After he was terminated he hacked the ctOS, shut the whole thing down, and after 4 people unintentionally died as a result, he went off the grid and into hiding. Like Aiden, he’s a man with some semblance of humanity to him. He understands what he did. He never meant for it to happen, but it did and he has to live with that. For the brief while that he’s in the story, he’s a character you can understand. The story as a whole was decent. It’s Uncharted 4 levels of greatness, but it has enough moments to make the experience worth the time investment. Unfortunately some of the big reveals didn’t quite shock me like they should have. Not because I already knew or had a hunch, they just didn’t do it for me. The necessary build-up was not there. I still got satisfaction from resolving it, but it could have been much more. 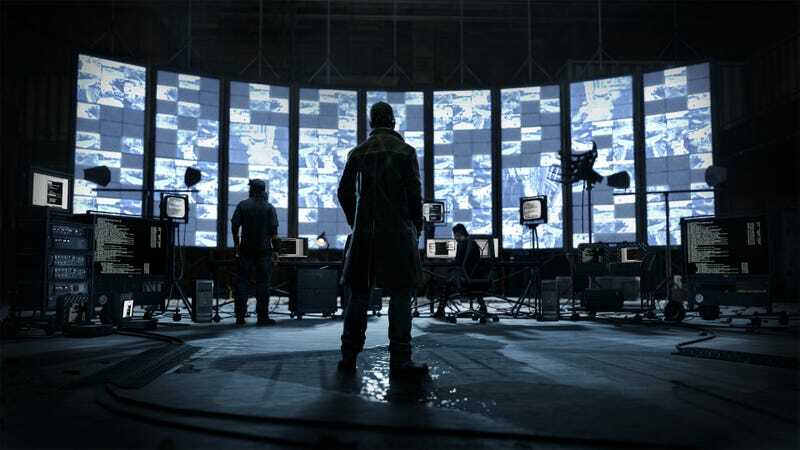 The main draw of Watch Dogs’ gameplay is the hacking. Many things are hackable and that leads to some very interesting puzzle and gameplay moments. However, it can become frustrating at times when the game doesn’t know if it wants to let you do something or not. Pile that onto the mediocre car controls and gunplay, and the hacking becomes really the only decent aspect of the gameplay. I was also very disappointed with the police AI and morality system. To start, the police don’t really act like police. They are nowhere to be found during your casual strolls through the city and no matter how much chaos you cause, they never show up. You can crash into cars and run over civilians and the police will never show up. And when they do, they don’t even attempt to arrest you. They just shoot you and they don’t care if a civilian is in the way. They will mow the civi’s down as well. And while your in a high speed chase? They’ll ram you continuously and overpower your vehicle, steering you into oncoming traffic or into a mass of civilians. And the death of civilians lowers your morality rating. So you can attribute a lot of that morality loss to reckless police AI that force you off the road and into people. It’s also next to impossible to escape from the police. No matter how many you take down, they will continually spawn and chase you. You have to get lucky and either break line of sight long enough to enter search mode, or take the L train to quickly escape them. And that’s provided they don’t mow you down the moment you step out of your vehicle. Many of you are probably very familiar with the Watch Dogs downgrade fiasco. It was shown off at E3 2012 and the graphics were like nothing we had ever seen before. Little did we realize that that wasn’t actually the game. It was a pre-rendered trailer made to look like gameplay. It was target footage. And over the next two years we got to watch as the actual game came together and the graphics slowly but surely took a massive hit. The end result was a game that was still beautiful, but very little difference between consoles and PC. It also had performance problems on PC that caused the game to freeze every once in a while, forcing you to wait it out. This made it really hard to drive because the game would stop and then rocket you forward when it came back. I crashed so many times because it would slingshot me into a wall. Luckily, two years later, that problem has been completely crushed and the game now runs smoothly. Despite the problems, there is nothing more beautiful than the nighttime skyline of Watch Dogs. It’s so beautiful as the above image illustrates and even moreso when it begins to rain as the rain affects everything and looks really great on PC, especially the reflections on everything. I may have been disappointed by the downgrade(Fun fact: The E3 2012 graphics options are actually in the game, albeit hidden in the code. Ubisoft claims it switched them off to solve performance problems, but as I mentioned they still existed and users who managed to get them to work again claim it actually HELPED performance. There are now mods that make the game look like it was originally intended to. ), but those nighttime moments more than made up for it. It’s hard to really sing praise for the soundtrack because like its modern open world cousins, it plays your average rock music when you’re in a car. It’s nothing to write home about considering you spend most of your time in a car going from Point A to Point B. On foot moments are a bit better because Watch Dogs has a synth/techno thing going on with its actual soundtrack. It isn’t Deus Ex, but it does its job of setting up a futuristic world technology driven world. And then there are a few standout tracks that play during particularly emotional moments, slow or epic doesn’t matter. Those moments I absolutely loved and wanted to put the music on repeat. The sound effects are also up to snuff. Guns pack a punch, hacking has the beeps and whistles you expect from something done through a cell phone, and cars sound absolutely fantastic. There really isn’t much to say on this front. The game did its job. I really wish that Watch Dogs was the masterpiece that it could have been, that I wanted it to be. It’s not bad, but it isn’t perfect and it stumbles where it counts. I can still recommend the game for its unique gameplay aspects and those few story moments that make it all worth it in the end. Sadly, gameplay headaches detract from the enjoyment, so it may not be worth it for some. But it does serve as a good introduction to the world of Watch Dogs and prepares you for the upcoming Watch Dogs 2, which to my knowledge does not feature any returning characters or plot threads. As mentioned in the verdict, Watch Dogs 2 does not feature any returning characters(thus far.) and that includes protagonist Aiden Pearce. Instead we get to see the city of San Francisco through the eyes of hacktivist Marcus Holloway. The development reason for the shift in protagonist is that Aiden Pearce just didn’t fit the atmosphere of San Francisco. His character changed when they tried to picture it, and so as a result they decided to go with someone younger and happier. The in-game reason also makes sense. After the events of Watch Dogs, Aiden moves to St. Louis to be with his family. This is revealed in the Bad Blood DLC. So it can be reasoned that Aiden is retired from the hacking life. Of course, that doesn’t mean he can’t appear as a cameo or a major player in future titles, but if Ubisoft decided to just leave him be, that would also be fine because his story really is resolved and he deserves some peace. The big difference of course is the setting itself. San Francisco is a much livelier, much brighter place than oppressive Chicago. It’s no longer just about big brother watching over you. It’s about any technological. Information is stored on everything and everyone has access to it if they look hard enough and that’s where the story of Watch Dogs 2 goes. Dedsec is fighting against the ctOS because privacy is a thing of the past. It has changed society drastically and needs to be dealt with. Marcus, a member of Dedsec, enjoys screwing with the ctOS. Watch Dogs 2 has a lot of promise and the developers seem to have solved a lot of the problems that plagued the first title. I may not pre-order this one, but I’ll definitely be keeping my eyes on reviews to see if it’s worth picking up.